Although a boon to semiconductor sensor, analog and RF-wireless IP providers, few practitioners seem able to clearly define intelligent embedded systems. The term “intelligent embedded systems” is popping up more often in blogs, public relations announcements – especially from Intel, and in trade journals. But what exactly does the term mean? The key descriptor seems to be the interconnectivity of the system. A recent IDC report defines a traditional embedded system as a fixed function, isolated system. Conversely, an intelligent embedded system is distinguished by its high performance, highly programmable microprocessors, internet connectivity, and high-level operating systems, among other things. At first glance – and even second more puzzled stare – it appears as if the phrase “intelligent embedded systems” is more of a marketing term than a useful description of the next evolution of embedded systems. Whatever you want to call it, today and tomorrows embedded systems are growing at a staggering rate. 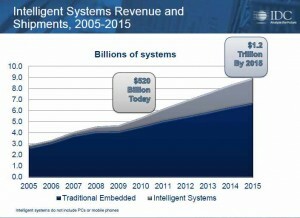 IDC estimates that intelligent systems revenue will increase by near $700 Billion over the next three years (see figure). It is interesting to note that IDC doesn’t include PCs or mobile phones in this forecast for intelligent systems. One thing that I’ve learned about intelligent embedded systems is that they include a lot of sensor, analog and RF-wireless subsystems. This is great news for the semiconductor IP community, as these subsystems should represent a large boost in analog and RF-wireless IP usage and revenue. Intelligent embedded systems? It’s nice. It seems to be another expression for “cyber-physical systems”, which are the things in the “Internet of things” or “Web 3.0″. In embedded systems the emphasis tends to be more on the computational elements, and less on an intense link between the computational and physical elements. Further reading suggests that “physical” systems are realliy “mobile” systems. But that still leaves much to the imagination. In my opinion, intelligent embedded systems (IES) are mobile, embedded systems with a strong interface to sensors and wireless subsystems. This would mean that CPSs are a subset of IESs. But since IES seems to be a term coined by Intel, I’m not all that sure that IESs is any more descriptive then CPSs.